View of the Great Unconformity in Grand Canyon; the Tonto Group above Precambrian basement records flooding of North America 505-500 million years ago, more recently and more rapidly than previously thought. Karl Karlstrom taking measurements in the Tapeats sandstone to decipher paleocurrent directions during deposition. 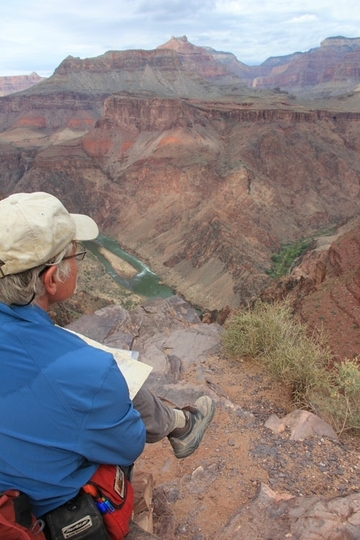 Karl Karlstrom sitting on cross bedded outcrops of the Tapeats Sandstone that was deposited at sea level 500 million years ago and is now exposed deep in Grand Canyon. Nearly five decades ago, in the late 1970s, was the last time a new formation was discovered and defined in the Grand Canyon with the discovery of the Surprise Canyon Formation. 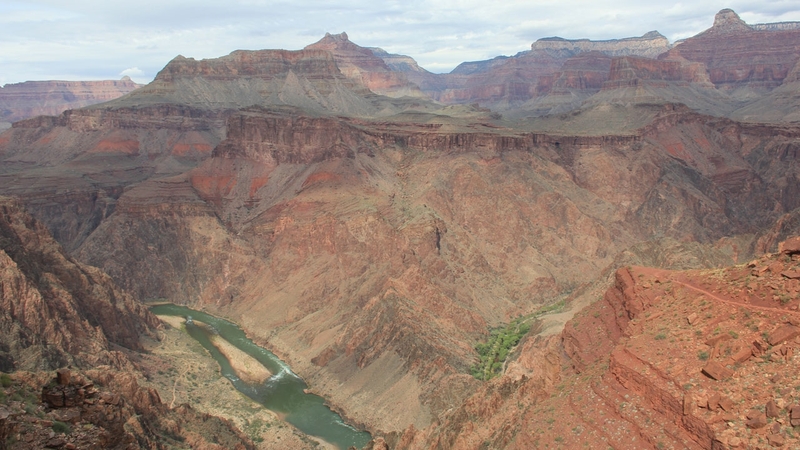 Now, a team of scientists, including The University of New Mexico’s Karl Karlstrom and Laura Crossey, have studied one of the last Grand Canyon strata to be dated – the Sixtymile Formation. 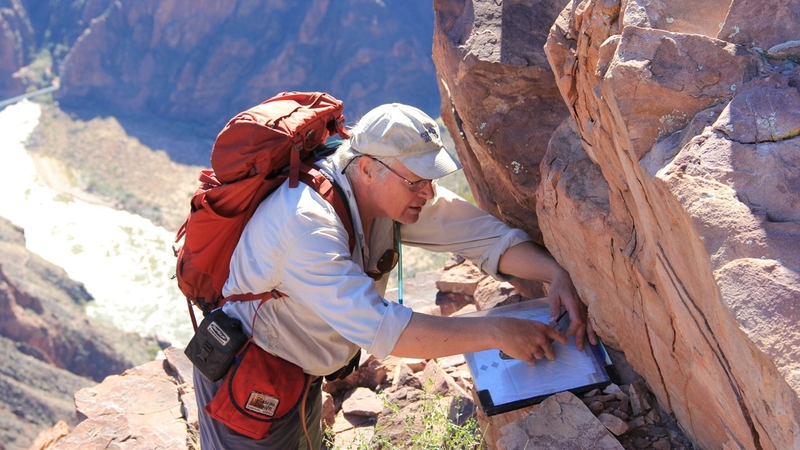 UNM Professor Karl Karlstrom looks at the basal sheet sands of the Tapeats Sandstone that pinch out to the left as they were draped across 500 million year old islands in the Cambrian sea. 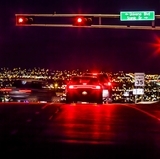 Their research paper, recently published in Nature Geoscience, titled “Cambrian Sauk transgression in the Grand Canyon region redefined by detrital zircons,” found the Sixtymile Formation sandstone to be much younger than previously thought. This unit occurs in only four outcrops in a remote and relatively inaccessible section of eastern Grand Canyon. It is found just beneath Grand Canyon’s Great Unconformity and was thought to be part of the Precambrian Grand Canyon Supergroup. 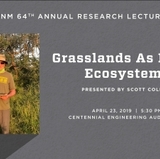 “Unravelling this science tale was an adventure in discovery, and involved (of course) serendipity, deep insight, and persistence – with a good dose of state-of-the-art geochronology and extreme fieldwork including several water/rock, heavily laden backpack treks along significant stretches of the Horsethief Trail among other remote locations in Grand Canyon,” said Crossey. The Sauk marine Transgression occurred during a period of time dating from the 600 to 500 million years ago when the sea level rose across North America leaving behind zircons, commonly found in sand, that contain trace amounts of uranium and thorium mineral deposits within specific sedimentary units enabling researchers to date the deposits. The age of Tonto Group of Grand Canyon, just overlying and hence younger than the Sixtymile Formation, was the serendipitous discovery. These layers record the marine transgression that inundated North America from its margins to the middle part of the continent (Missouri and Oklahoma). Think of it as what might happen today to the relatively flat continent of Australia if sea level rose (or the continent subsided) several hundred meters. It was considered to have been deposited over a lengthy time interval from about 540- 500 million years ago, but new detrital zircon grain dating shows it to be younger than the 505 million-year-old sand grains contained in it. 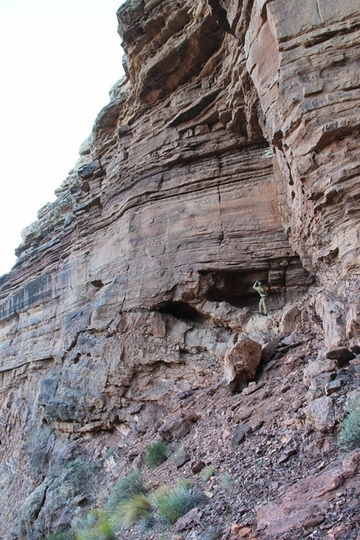 James Hagadorn stands below Great Unconformity in Sixtmile Canyon. The discovery was that the tilted Sixtymile Formation beds below the flat lying Tapeats Sandstone are less than 508 million years old, not Precambrian as previously thought. Detrital zircon geochronology is the science of analyzing the age of zircons deposited within a specific sedimentary unit by examining their uranium–lead (U-Pb) ratios. The researchers tested detrital zircon samples utilizing the U-Pb dating method, which can be used to date rocks that formed and crystallized approximately 1 million years to over 4.5 billion years ago with routine precisions in the 0.1–1 percent range. To this day, the Cambrian Period (541 to 485 million years ago) remains a geologic enigma: why did animal life become so globally diverse during this time; why were many continents flooded by advancing oceans in a way rarely seen before or after; and was there any relationship between these two unique features of Earth’s history? Diverse animal life was present 635 million years ago, and trilobites were making hard shells about 521 million years ago such that the new timing data in this paper do not support earlier models that have suggested that marine transgression across the Great Unconformity was a trigger for the onset of the Cambrian “explosion” in the diversity of animal life. To scientists and non-scientists interested in Grand Canyon geology, the paper redefines Grand Canyon’s rock layers and clarifies the age, nature, and geologically abrupt timescale of flooding of continents by oceans that took place 505-500 million years ago (Tonto Group Sauk II transgression). It shows that this event was later than and hence not the cause for diversification of early animal life but it opens new questions about the causes for early trilobite radiations and extinctions and their punctuated evolution which could they have been driven by multi-stage Sauk I and II global sea level or ocean chemistry changes. 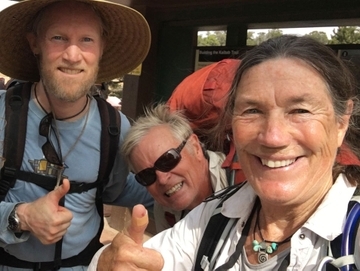 (l. to r.): Researchers James Hagadorn (Denver Museum of Natural History, Karl Karlstrom and Laura Crossey (University of New Mexico) at Phantom Ranch. 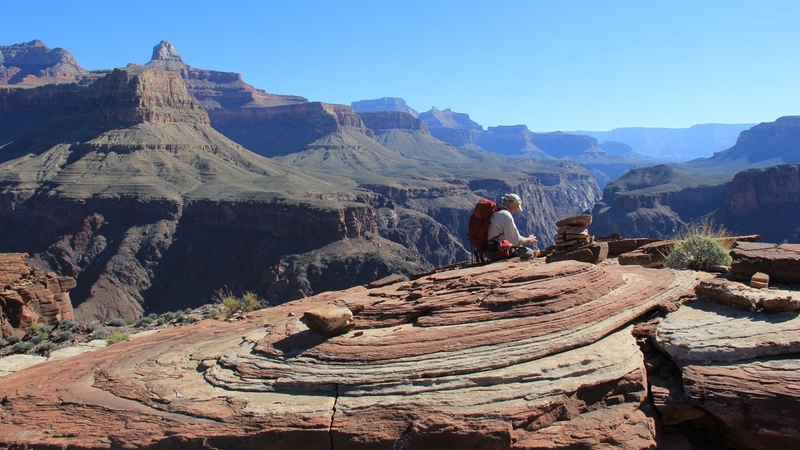 “This research, which involved an amazing group of collaborators, and the support of many graduate students, provides a marked revision of classic Grand Canyon stratigraphy by showing that the Sixtymile Formation is not Precambrian, but is middle to late-Cambrian,” said Crossey. “The rapid transgression is interpreted to have been driven by subsidence along the rifted margin and consequent abrupt sea level rise across a subsiding continent. 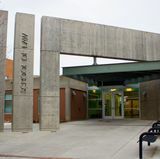 In addition to Karlstrom and Crossey, the international collaborative team included stratigrapher-paleontologist James Hagadorn from the Denver Museum of Natural History; geochronologists George Gehrels, Mark Pecha and Nicky Geisler from the University of Arizona, Mark Schmitz from Boise State University, William Matthews and Lauren Madronich from University of Calgary; and post-doc Jacob Mulder from Monash University, Australia.